As we all know, Valentine's Day is on Thursday of next week (before The Nail Files), so I thought I'd share a Valentine's manicure for this week's Nail Files. Since I'm not a fan of the colour red, V-Day manis pose a bit of a challenge but I was up to the task. I'm quite into the ombré fad at the moment so I figured I could do a pink/purple combo and then go from there. A new sparkly polish caught my eye, and the rest came together nicely after that. Two coats of everything. 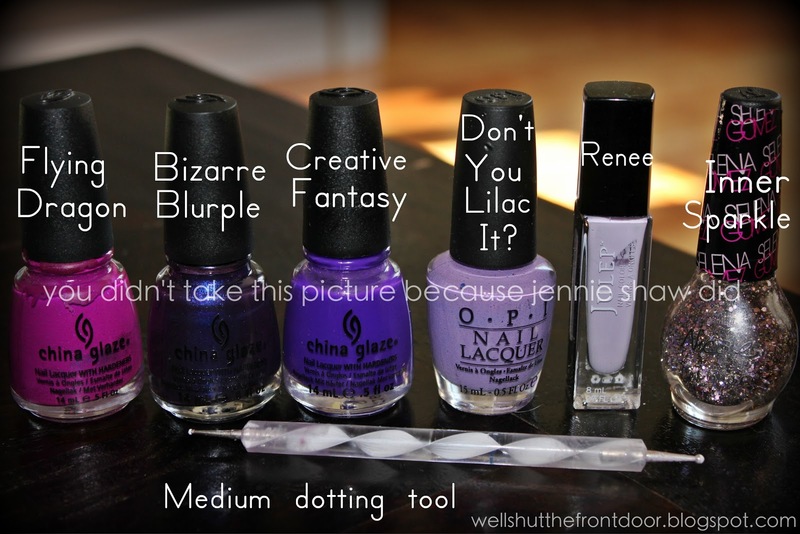 Starting with my pinky there's Renee, Don't You Lilac It?, Creative Fantasy, Bizarre Blurple, and Flying Dragon. Then, with a medium dotting tool, I put white hearts in the top left corners of each nail by making a "v" shaped movement (white polish was Finger Paints' Paper Mâché). To finish it off, I put Inner Sparkle on the bottom third. I'm not going to lie, guys...this may be my favourite mani EVER! I freaking love the ombré fade and the little hearts are too cute for life! Inner Sparkle is my first Nicole by OPI polish and it's effing beautiful! Little gold sparkles, slightly larger lilac sparkles and then bigger rose-coloured hexagons. It had great coverage, too! I'll definitely be keeping my eye on this brand from now on! Hope everyone has a great weekend and awesome Valentine's Day!! Thanks to Tara and Vicki for hosting! Seriously so creative!! I'd never have thought of that look! This is super cute, Jennie!! Adorable! I love this, very creative and not over the top Valentine's-y. I'm going to attempt hearts for Vday...stay tuned for my potential fail. that's a lie, if I fail i'm going to pretend it never happened and delete this comment. Also - fantazmic nails as usual! you could probably make a career out of this! Awesomeness Jennie!! Way toooooo cute. Great job on the hearts! Wow that is seriously so cute. Did it take you forever? I am so impressed. I say that every time, but I am. I dont know how you are able to do those things on such tiny little canvases! Hi, just browsing through the Nail Files link up. This is SERIOUSLY too cute. I'm going to pin this and link back to your site. GREAT JOB! I attempted the "dotting heart" this week as well. But minus the dotting tool. EPIC FAIL!! I seriously need to invest in a dotting tool...or two. This looks great! The choice of colors makes the flow from nail to nail fantastic. This is adorable and completely festive! Talk about patience! I love it!! The little hearts are the best part. Great job! Oh my goodness, your nails look precious. I love it! 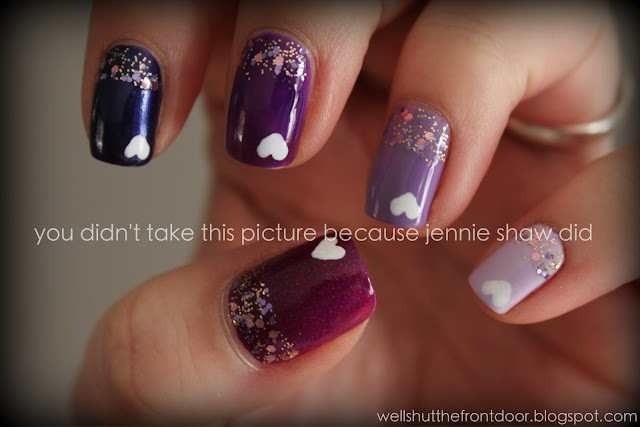 The hearts are so cute and I love it with the purple ombre and glitter! SO pretty!